We’ve talked about whether or not it is ok to pray for your business, or if it is ok to have wealth. 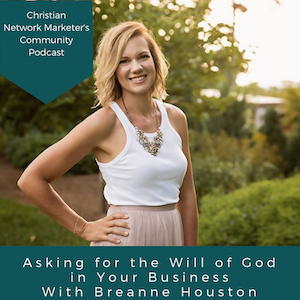 Today Tasha is going to talk to Breanne about asking for the will of God in your business. These are just some of the highlights of the interview with Breanne. We encourage you to listen to the podcast, or watch the interview from the video below. Something that Breanne points out early on sometimes it is hard to step out of what is going on in your life to see how God is working. Breanne talks about how she prays for God to put in place people that she can help, and she prays for God’s will to align with hers. And if her will is not in time with His, her prayer is that He shifts her desires towards His. However, that sometimes means learning His will the Hard Way. Even during a hard time, though, Breanne could see God’s glory through her own life and some of those people around her. This led to a shift in thinking about her business as a person-focused business, rather than a money-focused business. Breanne recognizes that it is easy to call what happens in life as a coincidence, or to take pride as accomplishments we have done, but when we depend on Him to show us where to go, and we keep stepping, we can look back and see what He is doing. Breanne and her family feel from God that they are one puzzle piece in God’s bigger plan, and He has an even bigger plan in mind than what He has already shown them. A lot of our success in our business is seeing opportunities and taking action on them. Not being bogged down by fear or “what ifs?” He will give us opportunities if we ask for them, so we can’t turn our backs on those opportunities when they come up.